Last weekend, LSU players gathered at teammate Christian LaCouture's apartment to watch the BYU-Portland State game. As the Cougars offense struggled to gain traction against its FCS competition, its SEC-opponent for this week was watching. Despite those struggles, that may play into coach Kalani Sitake and his Cougar's favor. Not many outside the state of Utah are giving BYU much of a chance to beat LSU. The cougars are 13 point underdogs in the game. That said, history could be on the cougars side. BYU is 6-5 all time against six current members of the SEC. And the cougars have two big week 1 victories over Power 5 opponents on neutral fields: 14-13 win over Oklahoma ('09) and 18-16 win over Arizona ('16). This year's BYU team is bolstered by a staunch defense, especially up front, that is coached by second-year defensive coordinator, Ilaisai Tuiaki. Across the ball, LSU's offense is undergoing a bit of a makeover. The Tiger's new head coach, Ed Orgeron, made it a top priority to bring in a top-rated offensive coordinator, Matt Canada from Pittsburgh. Known for its bruising, power rushing attack, this season, LSU is searching for its offensive identity. The Tigers lost its top running back Leonard Fournette to the NFL, but the talent level doesn't drop off, as the tigers feature Heisman hopeful, Derrius Guice, who has missed parts of the last week with minor injuries. This spring, LSU's offensive line was expected to be a strength. Since then, the tigers have lost 11 players to attrition, five of them from the offensive line. Starting guard Maea Teuhema's suspension and transfer was probably the biggest loss. During fall camp, the tigers have been forced to rely on contributions from walk ons to run drills and scrimmages. BYU's front seven against LSU's ailing offensive line is a match-up that favors the cougars. In 2016, LSU allowed 19 sacks on only 298 passing attempts. The tigers offensive line has been compared to road graders, but when it comes to pass blocking, LSU's offensive line sometimes struggles without many true tackles. After attrition LSU only has three true offensive tackles on its roster: Sr. K.J. Malone (son of Utah Jazz F Karl Malone), Jr. Toby Weathersby, and Fr. Austin Deculus. LSU will use converted guards at tackle to shore up their depth, which provides opportunity for Sione Takitaki and teammates to get pressure on LSU's quarterback, Danny Etling. Last season, BYU missed Takitaki, who redshirted while working through off-season issues. Takitaki has returned to the line-up with more focus, and that is paying off with two sacks this past week against Portland State. BYU returns 61.5% of its pass hurries from 2016. In an injury-plagued season last year, LSU's Etling struggled against competition that put pressure on the quarterback. During the off-season, Etling had shoulder surgery and reclaimed the starting role according to Orgeron this past week. If there is a trademark of Ilaisai Tuiaki's defense, it's the ability to create turnovers. BYU was #2 last season in turnovers gained and #7 in turnover margin in the FBS. Last week, the cougars got a late fourth quarter interception by safety Zayne Anderson that helped seal the win. Across the line of scrimmage, LSU will be running its new Matt Canada offense for the first time against opposition. Canada's style involves pre-snap motion in order to create NFL-like personnel mis-matches. The tigers will be attempting to do this with a relatively inexperienced receiving corp. After starters D.J. Chark and Russell Gage, the remaining LSU receivers have amassed only 10 receptions across the group. Offensive coordinator Matt Canada promises that the new-look offense won't resemble the old one. 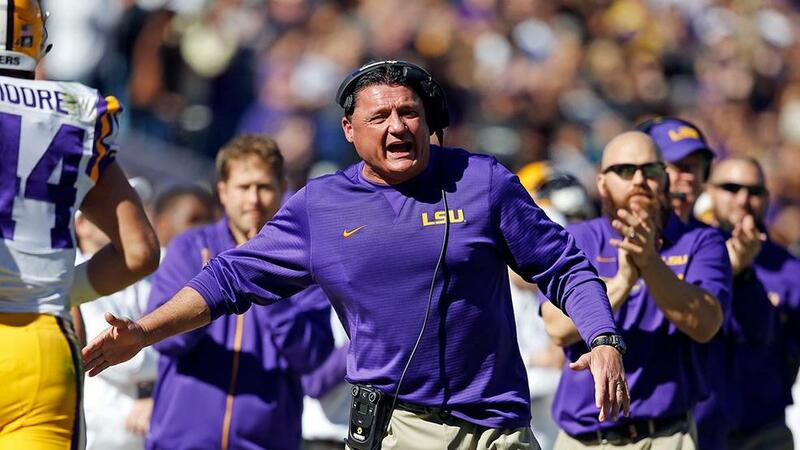 LSU's offense struggled during its rain-shortened spring game, and there was disagreements over how much of the new offense was installed over the spring. Struggles by LSU's new offensive scheme and limping offensive line could force the tigers into situations that favor BYU's ability to take the ball away from its opponent. Swings in the turnover battle could give the cougars a short field. Orgeron announced this week that LSU will be without its leading defender Arden Key, who has been sidelined all camp by a shoulder injury that required surgery. Also, LSU's prized NG recruit, Tyler Shelvin, was only recently allowed to begin practicing with the team, but is academically ineligible to compete this season. The tigers have faced injury and turnover to the NFL draft before, but this year's LSU front seven will be high on talent and light on experience. Unlike LSU, BYU's offensive line has been more steady. Returning four of five starters, the cougars' offensive line anchors BYU's offense. Sr. center Tejan Koroma leads this unit that will be blocking for a running back by committee. Gone from last season is cougar-legend Jamaal Williams. Jr. Squally Canada got the most carries last Saturday, and ended just two yards short of the century mark. Canada and his fellow runners will look to take pressure off quarterback Tanner Mangum. If BYU is able to exploit their advantage against a young LSU defensive line, the BYU ground game could help lead the cougars to victory over LSU. BYU isn't intimated by LSU. After all, the cougars have beaten SEC opponents before. With a thin and ailing offensive line, BYU's defense could lead the cougars to the win over the Tigers by shutting down LSU's new offense, pressuring the Tigers into turnovers and taking advantage of the short field to score points through its rushing game. If BYU can win these battles, the cougars can top the tigers.